Usefulness of Test Corrections – Physics! Blog! I’ve always had my students do test corrections. When I used to award points, I would give some out (or “back”) for doing good corrections. I asked my students to complete them without consulting peers (though they could use their notes and could talk to me). They also had to make a statement for each problem about what went wrong and why they made the mistake (and anything along the lines of “it was a dumb mistake” was not acceptable). Since the homework assignment could raise their test grade, and since they could get as much help as they wanted from me, it would seem like a “no-brainer” one to do and do well, right? Here’s what I saw from my students: those few “best” students would take full advantage of the correction process, just as one would expect. On the other hand, many would copy correct answers from other students (claiming they didn’t know they had to do it on their own when I noticed), and the depth of thinking about what went wrong was almost universally absent. I would get many submissions with identical wrong work to what they did on the test (did they not read my note? Did they just do the problem again without looking at what they did? Are they really that oblivious?). And the worst: the students with the poorest grades on the test often didn’t turn the corrections in at all. Standards-Based Grading to the rescue! Last year, with SBG, I required students to complete test corrections (and additional practice beyond those corrections) before getting a new opportunity to assess outside of class. There were no points to give back for those corrections, and I didn’t restrict my students from looking at peers’ tests. There was also no timeline or deadline for completing this work. What happened was totally different from the way things were before. Students might have looked at friends’ tests, but they never would have been satisfied stopping there. They were relentless in trying to understand both their mistakes and the correct solutions to problems. They showed me their work, asked me questions, and persisted with the assignment. They wanted to know that their work was correct, not just that they had checked their answer. Suddenly, all of my students were eagerly following the process that had always helped the best students succeed. And they were doing it even though good corrections were rewarded with another test, not automatic points. Actually, they were doing it because of that. Standards-based grading demystifies and motivates good habits of learning for students. I hear that objection occasionally, and it even came up again at our science department meeting this week. Honestly, it is a bit of a nonsense statement/question. So, in addition to learning physics better, increasing their confidence as a student, seeing themselves improve with a challenging skill over time, they are also rather specifically learning how to milk the benefits from making mistakes, what to do when they aren’t immediately successful, and how the best students have been succeeding in school all this time. Concerning the “what about in college” question: If students only do test corrections to get points back, then they won’t do test corrections if points aren’t given back… as is often the case in college. But if students have gotten used to the idea that doing test corrections is a way of addressing their misunderstandings and confusions, then they are more likely to correct their tests in college. So what you are doing is preparing the students for college BETTER than those who give points back for test corrections. I have heard the same complaint about breaking a unit into learning objectives. This demystification of a unit is seen by some as hand-holding. Instead I look at it as showing the students how to break down a unit. They should be ready to do this themselves by the time they get to college… no learning objectives needed from the professor, because they know how to create learning objectives themselves! I’m thinking of having my seniors create their own learning objectives to compare with the ones I’ve created (after they’ve seen objectives from several chapters). Also, you’ve made another good point about test corrections (re: retaining the habit). I get my students to do quiz corrections much like you described as your previous method and am going to offer similar homework correction marks to my 3rd year quantum students this term. And I would love to have the same experience as you and have ALL my students put in the effort and genuinely learn from these correction assignments. Since I am planning an SBG implementation in this course the next time that I teach it (this round is about taking notes to set up a smoother transition), I’m very excited to hear that the SBG framework really helps motivate students to take advantage of the feedback and reflection process. With the points back, students would initially be very prompt in doing the corrections, but would become less and less so as the year went on and the material became more difficult. With SBG, the reverse happened. As the material became harder and as they became more used to the class, they realized the benefits of figuring out what went wrong as soon as possible after the test. I had some students would be ready and eager to assess again within just a couple of days. Ah! This is so interesting! I was a physics major in college, and I’ve occasionally thought if I change careers I might go into teaching physics. I can’t wait to start following your blog! I couldn’t agree more. I remember when I was in elementary school, and in Grade 6 we wrote a final exam to get us ready for Grade 7. The Grade 7’s wrote a final to get ready for Secondary School, because in Grade 8 they wrote finals. Why did the Grade 8’s write finals? To get ready for 9 and 10 of course! Which was to get ready for 11 and finally Grade 12, which was the only grade (at the time) that had a province-mandated exam. That is just insane. How do you approach tests at the end of a unit? I assume that throughout the unit, standards are being assessed by quizzes. So what is left when you get to the unit test? Is it primarily for students that haven’t achieved all expectations for the standard? I’m a fairly new teacher, and when I come across a unit test, they are usually long-ish and have multiple questions that address the same standard. Like 2 or 3 projectile questions that have different wording, 3 or 4 vector questions with different wording or perhaps subtracting a vector instead of adding it, etc. This doesn’t make sense to me in a SBG way, unless the standards are micro-managed to very small reductions. For example, A1 add a vector; A2 subract a vector; A3 add 3 vectors; A4 etc…. This year I’m not doing unit tests, per se. I’m doing a test (well, I’m calling it a “quiz”) every week. Everything we’ve covered so far is always fair game. So far so good. I thought I would want the tests still, with the multiple measurements on each objective, but actually I don’t think I need them. I think I’ll do a big one after unit 4 (UBFPM) and after unit 7 (COEM), but otherwise just various length “quizzes” instead. I’ll probably post more about this once we get more into the year (or after the first exam, when I see how that goes). If you tell your students to come to University of Wisconsin – Stout and take physics they WILL be graded this way. 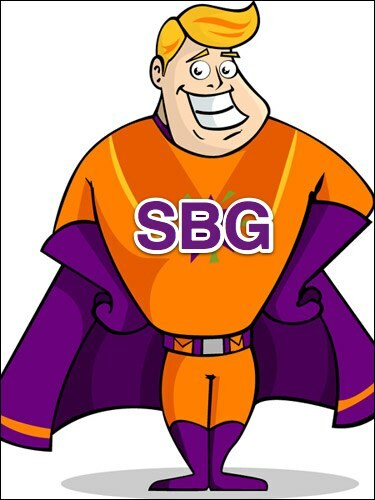 I’ve convinced all but one of my colleagues to try some form of SBG. I’m also working with the Apparel Design department is also looking at trying it out. I expect more faculty will start switching as they start to see how much better prepared the students are coming out of a class that is using some form of SBG.